It wasn't supposed to go like this. 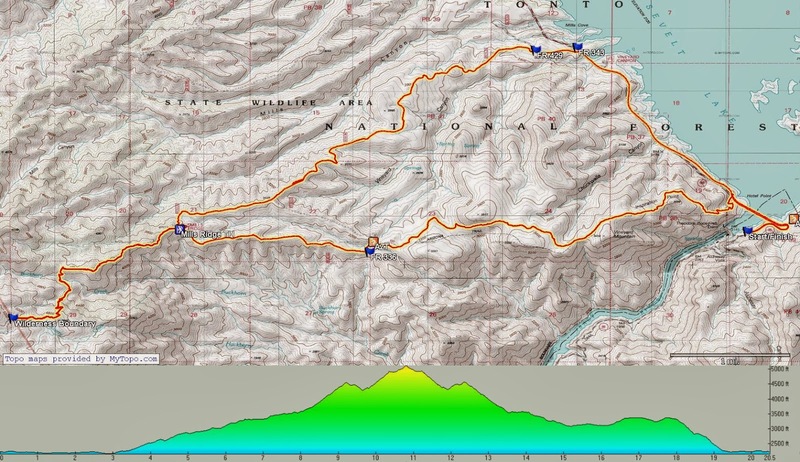 I was planning on riding the AES Antelope Peak Challenge 65 on Sat. Almost a full year had gone by since I witnessed a few riders stagger across the finish line for the inaugural Gila 100. 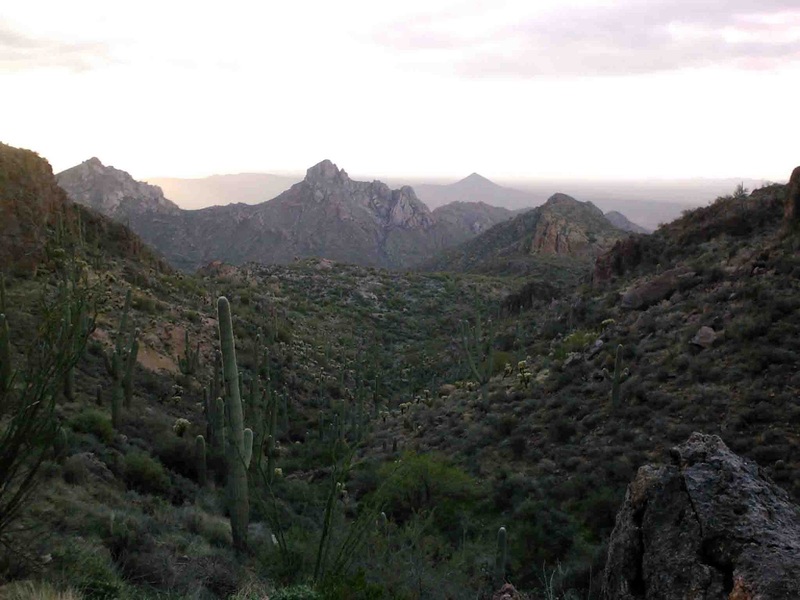 I had no interest in riding the AZT in that direction. Then last week Mark posted up looking for interest in people camping out at the finish. I thought, hmmm, maybe I could have Mark bring me back to Picketpost on Sunday morning for my car. Why am I suddenly contemplating this ride?? Mark ended up having school responsibilities, so my 'plan' was nixed, back to the APC. I was happy with that. Little did I know that Mark passed along my intentions to Jeff / Nancy, they would be camping out Sat. night and could offer me a ride back to Picketpost on Sun. Let the self-destruction commence. So, it was back on. Am I really entertaining this ride?? I had a lot to prep, so I made good use of my time in the days leading up to the 5am start on Sat. Gila 100 elevation profile, am I sure about this?? Nancy was kind enough to meet me during the week so I could drop off a change of clothes & some post-ride snacks. I actually did some maintenance on my bike, I tend to neglect it after big rides....so tired. 3:15a came quickly on Sat., but I was ready & hit the road before 4a. Hunter was the only one at Picketpost when I arrived, we chatted a bit and readied ourselves for the long day ahead. Myself & Eszter making final adjustments. Photo by Evan. Carlos soon passed by me and I watched those 3 meander up the trail for the next mile or so. Around the 4 mile mark was the last time I clearly saw anyone in front of me. I may have caught a glimpse of someone crossing FR4, but when I approached that point there were a group of lights off to the right of the trail. Instinctively I rode towards the lights thinking it was a rider or two, but it was a camp of through-hikers stirring in the early morning and they quickly re-directed me back on route! 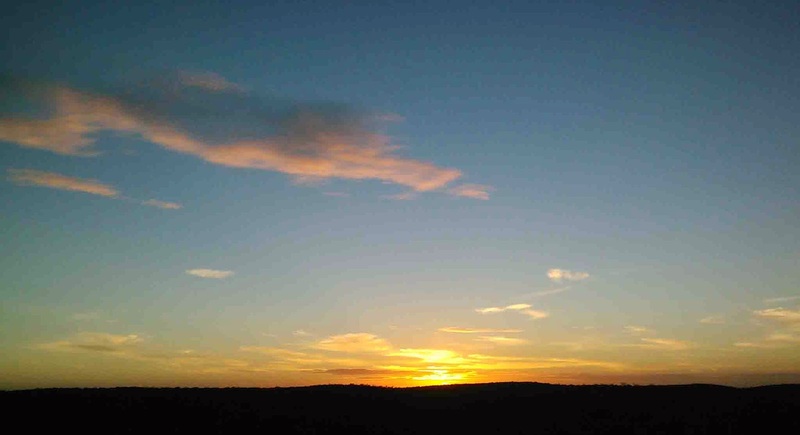 Daybreak came as I topped out on the 10 mile overlook. I scanned the small valley below for lights, but saw nothing. As I descended I noticed how much better the tread has become through this area compared to the first couple of times I rode it years ago. 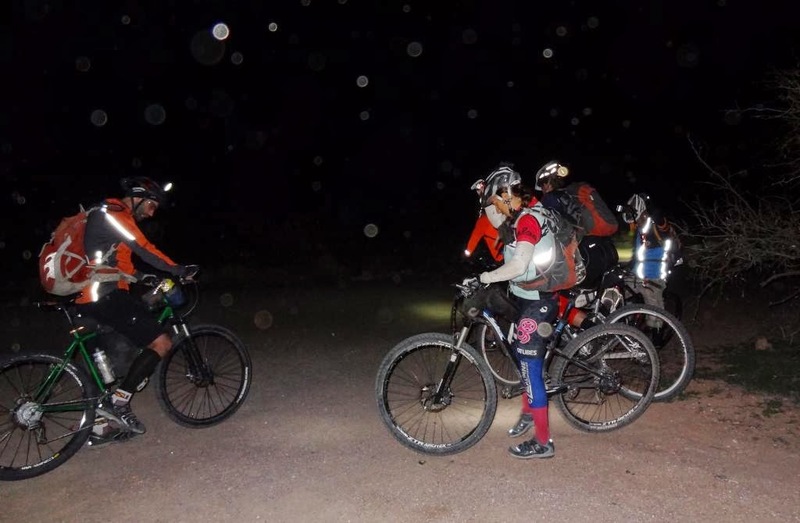 The lights went off during the ensuing climb to Martinez Canyon. 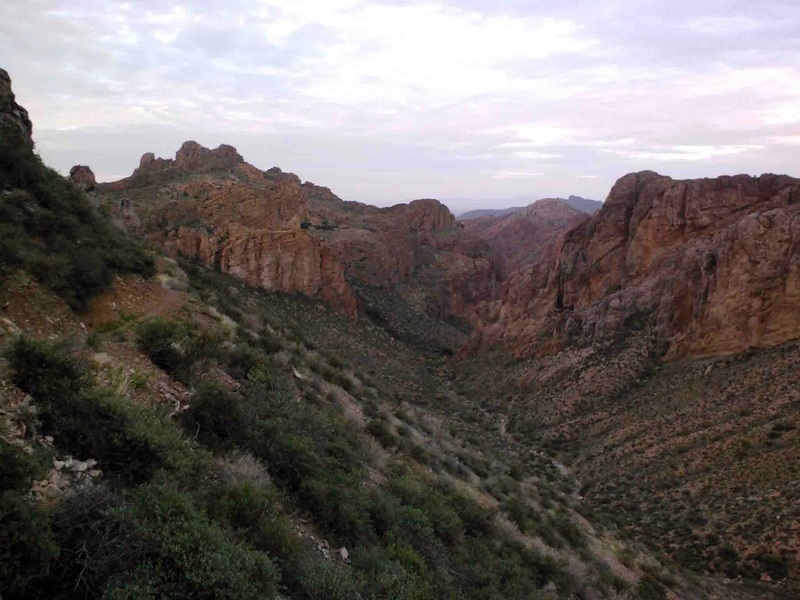 I'd venture to say that Martinez Canyon and the subsequent descent to the Gila River hold a very special place for anyone who has been fortunate enough to experience it. Amazing geology, the grand scale, endless views, it's such a privilege to ride here. 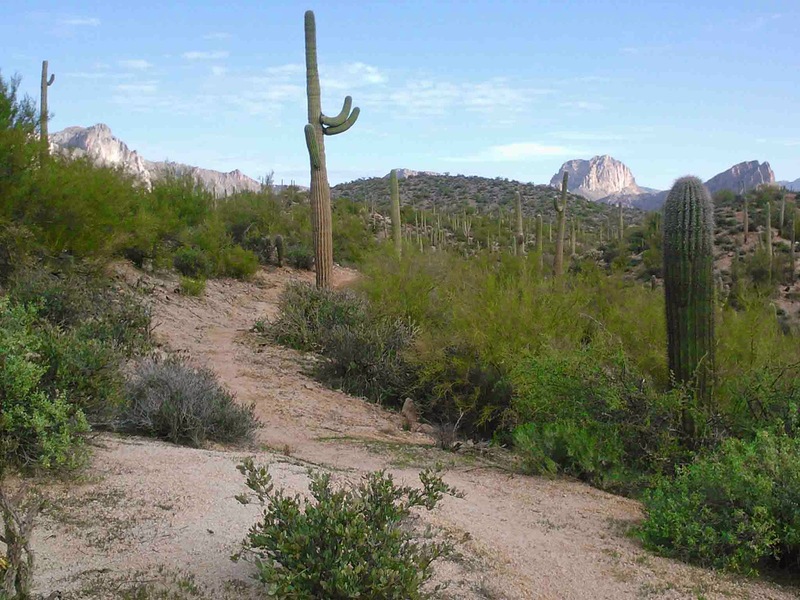 Thank you Arizona Trail. Early morning rays of light flood the Gila Valley below. Thankfully the daylight brought about a better bike handling skillset. I was feeling good, taking it all in, enjoying the solitude in the desert canyons. I tried to keep some checkpoints of sorts throughout the day. I wanted to be in Kelvin before noon and I was ahead of pace. The bumbling through the darkness slowed my progress a bit, but that was over now. 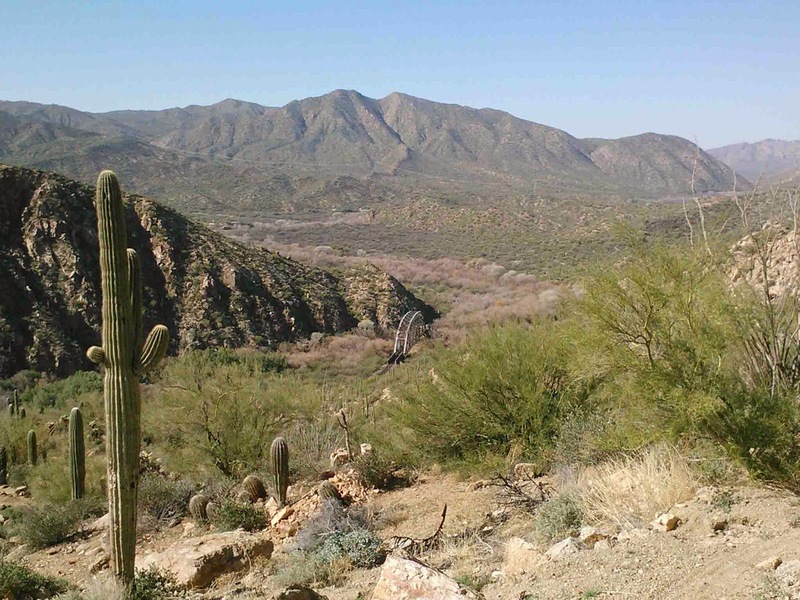 Next up: 16 miles of great singletrack, mostly anyway, along the Gila River. 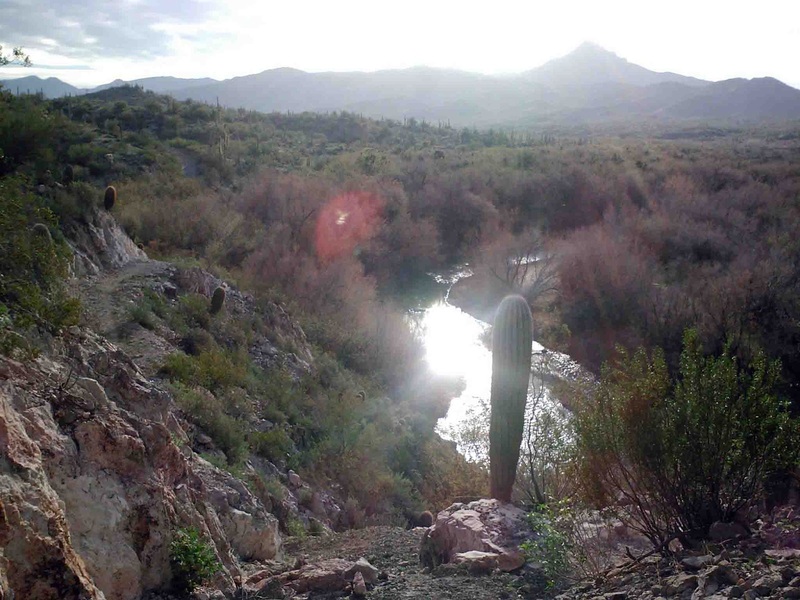 The first real view of the Gila River. Nice spot to take a quick snack break. I was cruising along counting down the river climbs towards Kelvin when a rider appeared coming from the east. 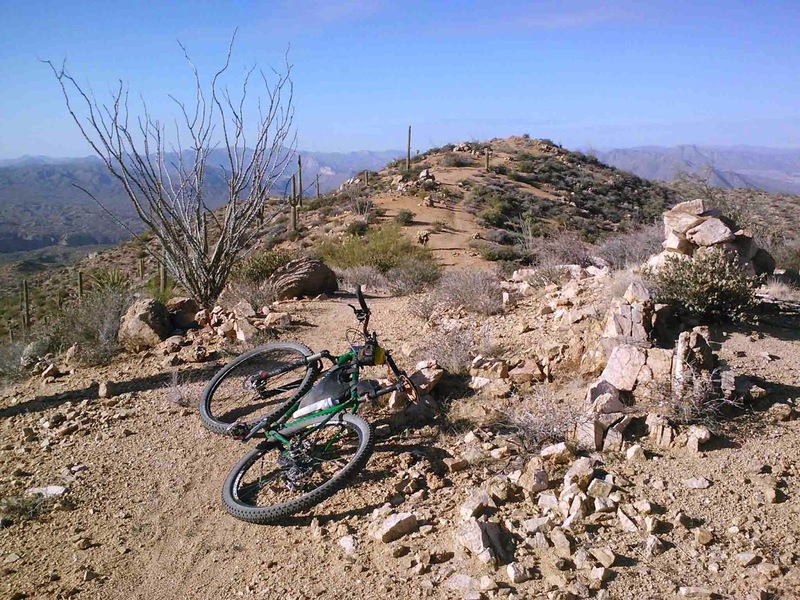 Just a solo rider out enjoying his first time on the AZT down here and he was loving it. We chatted for a minute or two and he mentioned there were a couple of riders not too far ahead. That's good, I thought, I guess I'm not going as slow as I thought!! One of the obligatory viewpoints near Kelvin. I was really surprised to see a few random poppies already blooming...it's January!! They typically don't show themselves until March, but it was wet back in October and now it exceptionally warm & dry. 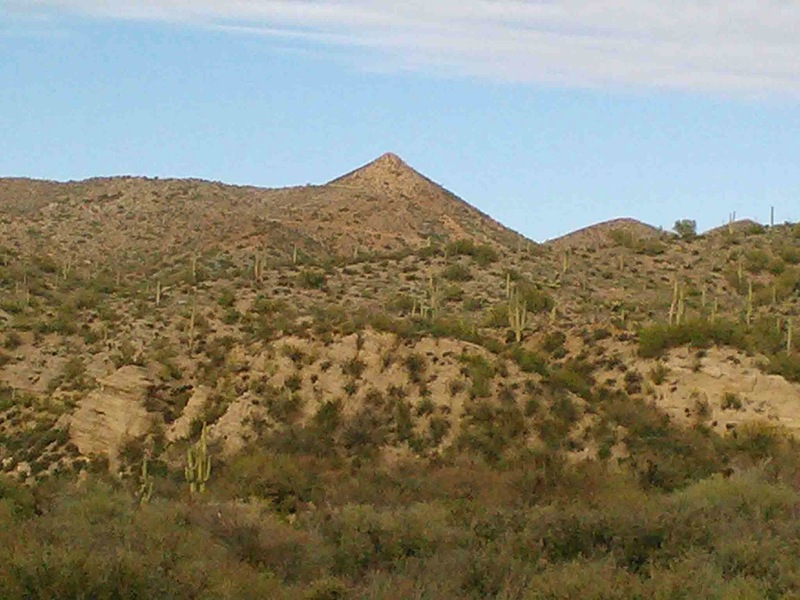 The AZT Golden Spike viewpoint. The final downhill into Kelvin was littered with poppies, it was surreal. I pulled off-route by a quarter mile to a trailer court where they generously allow AZT travelers the use of a water hose. It was now 11:45a. I broke out my 2lb burrito again and attempted to make more of a dent into it. It was nice to sit down on a bench for a bit, but I had to get moving. I topped off my water and was on my way shortly after noon. The next section was the only piece of the route I had not been on in this direction. We typically ride the Ripsey segment south-to-north because of the big downhill finish. Well, that means there's a big uphill start from here!! 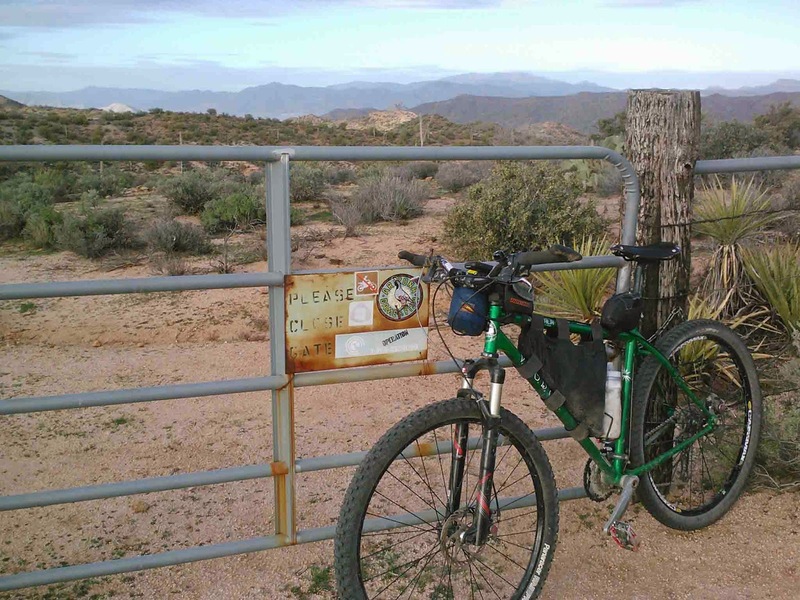 The two mile connector of AZT from the Gila crossing up to the Florence-Kelvin highway was a real drag. Steep in sections and lots of loose kitty litter crushed granite over hardpack made for some real slippery riding conditions. I still had yet to clean a single uphill switchback on the day!! Not a one. This would continue for whatever reason. I was quickly becoming more and more drained going up the Ripsey approach. This is the part of the climb I thought I'd be able to ride cleanly, not so much. Maybe I stopped too long in Kelvin? My legs were now heavy and I didn't have much at all on those climbs. I even thought about turning around to head down to Kelvin. Maybe I should just do an out-n-back to Picketpost?? What was I thinking!! It was definitely one of those inevitable down moments in a ride of this magnitude when you question your ability to finish what you started. I pushed on. I reached the lower gate, then the short rocky drainage that signaled the beginning of the switchback attack ascent of über steepness. Yet somehow, I was happy to be on it. I walked a ton, but rode here and there, only slightly faster than pushing. Each step brought me closer to the top. Soon the views were grand and the terrain looked and felt like Ripsey!! I'm getting close! Near the bottom of the big grunt up Ripsey, long way to go. At least I had these views to catch my breath. It was now early afternoon and I couldn't help but think 'where was everyone?'. 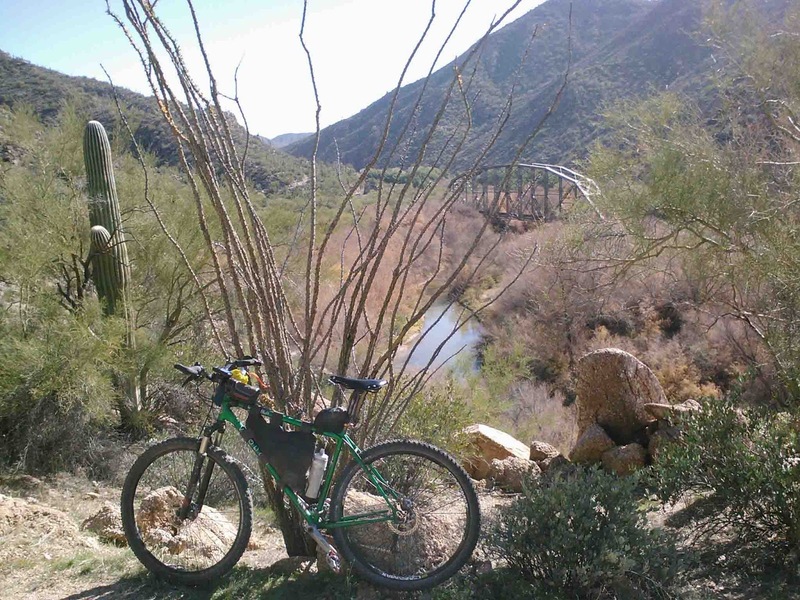 By everyone, I mean, the day riders, it was such a beautiful day and no one except our handful of riders were out enjoying this slice of Arizona!! Not five minutes from attaining the ridgeline a solo rider came down the trail. Finally, at least one other person was out on Ripsey today. Even though the switchback attack section was now behind me, there was still more climbing to do. 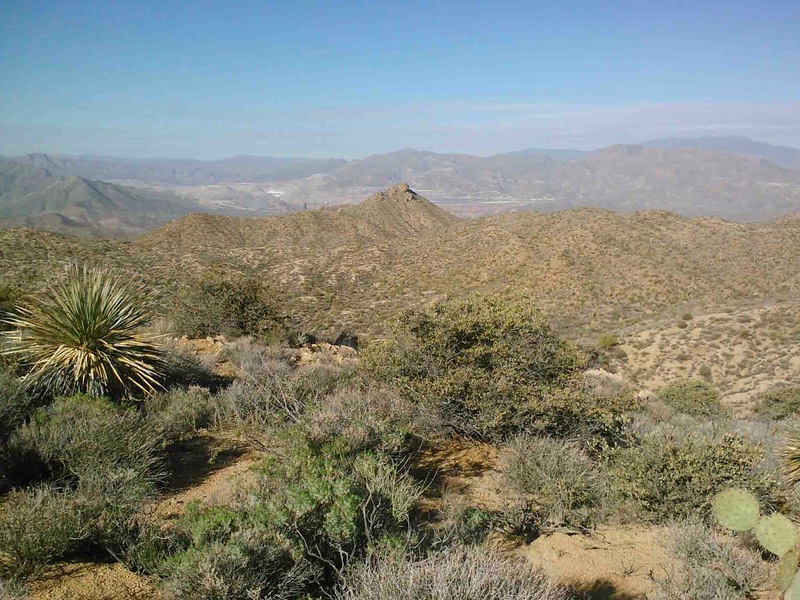 The trail undulated a few times then at long last dumped me onto the famous ridgeline Ripsey is known for. I had crested the mound in the distance, but my bike insisted on looking back at it!! For the first time I was going to ride down 'The Big Hill'. I still struggled with the upper switchbacks, not totally out of my bike handling funk from earlier. The good news about riding this direction? The deep sands of Ripsey wash were rideable in the slightly downhill direction!! 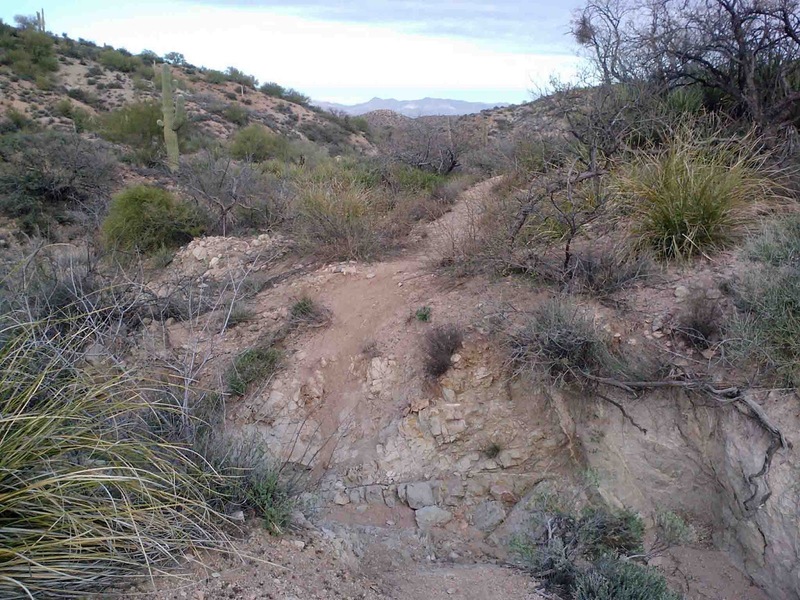 I wasn't looking forward to riding up and out of the wash, last time I was here a few months ago it was heavily overgrown with catclaw & the trail surface was in poor shape. Much to my surprise, I was able to ride a considerable amount and nary a scratch! My short-term goal however, was reaching the gate at the top of the wash exit, that would signal the end of the Ripsey climbing segment. A look back at The Big Hill. This piece of trail really needs some work to repair a developed chasm. Never been so happy to see a ranch gate, but I could have swore it was green?!? It had taken me the better part of the afternoon to cover 11 miles, it was now 4:35p. 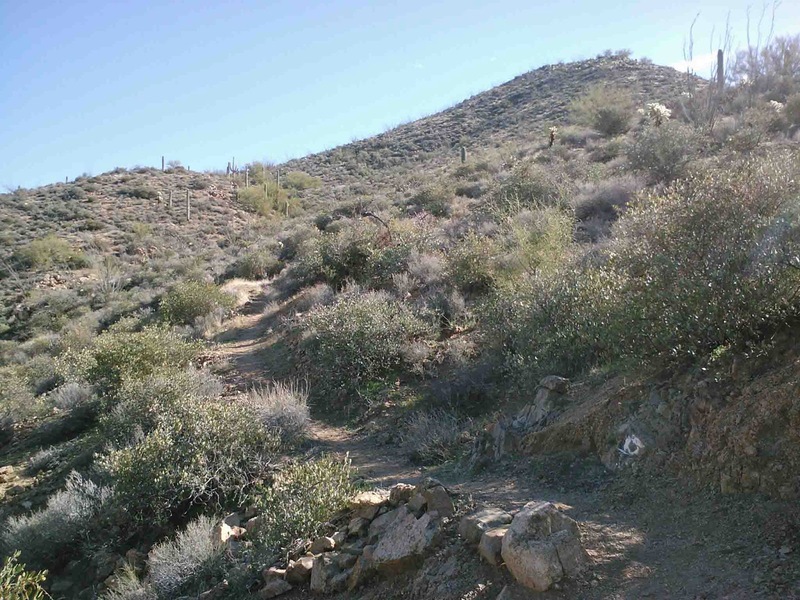 I was whooped and my left knee was beginning to show signs of fatigue, but I knew I had some much easier miles approaching leading into the Freeman Rd trailhead. This was the next and last water cache, a good place for a meal as well. I originally hoped to be there around sunset, but I was up against it now with barely 1 1/2 hours of daylight remaining. No biggie really, just keep pedaling. I covered the ensuing dirt road, singletrack and powerline portions in good time, I really needed that section - it lifted my spirit. I entered the singletrack of the Boulders segment and knocked out a mile before relenting in favor of my nighttime setup. I was about 9 miles away from Freeman Rd. Last rays of light over the Boulders segment. Darkness settled in and I resumed my trek south. I could feel my knee slightly ache with each pedal stroke. What's this? I haven't had knee issues before when doing these events although there have been a random ride or two where things didn't feel so good towards the end of a long day. I wasn't all too concerned. From this point on, a whirlwind of events unfolded. From my viewpoint I rounded a corner and saw a couple of LED's off to the side of the trail... there were bikes! There were two riders, one was lying on the ground in a fetal position and indicated he was being air-lifted out!! He appeared to be suffering from severe cramping and couldn't keep food down. They had been there over an hour waiting for the heli to arrive. The other rider told me his truck was parked at Freeman Rd and asked if I was going to continue on or did I want a lift to Tiger Mine trailhead (finish line). I declined and went on my way after 5-10 minutes or so. I arrived at Freeman Rd around 7:45p and the downed rider had already been dropped off at the truck. He seemed to be doing much better, which I was very glad to see, but kinda questioned the need for a heli ride out. I began to eat some pizza as I prepared to head back out. Soon thereafter the other rider showed up and began packing up the truck asking once more if I wanted a lift to Tiger Mine rd. I declined again as they finished loading up the truck. I was walking around trying to get my knee loose and I realized it was both the front and now back of my knee bothering me. Perhaps I should make the call and take the lift? I thought about what lie ahead on the trail: a nasty loose downhill HAB into Beehive Well, then the monstrous HAB/climb out of Bloodsucker Wash and the ending with 6 steep drainage crossings. I made the wise decision and opted for the truck ride back to Tiger Mine rd, it was tough to call it, but it was the right call. It was now 8p and I would have been looking at a possible 2-3am finish. My bike was running fine, I had plenty of water/food, but feared my knee would be a hindrance and didn't want to jeopardize it. Back in Oracle we stopped for some food and I tried to let Jeff know of my whereabouts, but they had already started to drive up to Freeman rd to check on me!! A little while later we all me up at Tiger Mine TH and opted to drive back to the big city that night. We missed seeing Eszter finish the ride by a few minutes, the first female finisher of the Gila 100!! 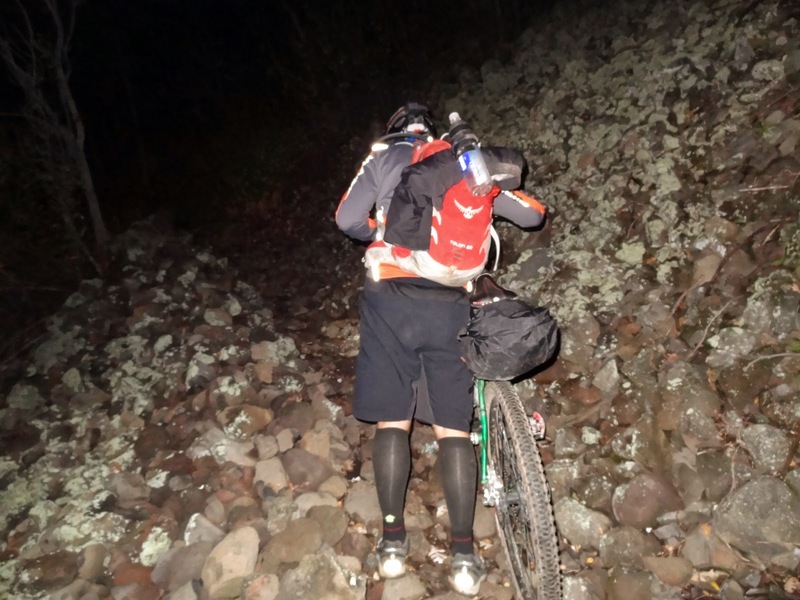 We also learned that another rider was still out on course roughly 7 miles from the finish, but had contacted the Sheriff after running short on water/food. He ended up being found and was ok, but these two incidents sparked a worthy conversation re: the need for outside assistance. Eszter provides some wonderful incite into self-supported vs self-reliant events. This was the toughest one-day event I've participated in. I went through many highs & lows during my time on the trail. I wanted to quit, I wanted to take a nap, I just wanted to be done at the finish line, but it wasn't meant to be this year. So, I guess I'll be back for another attempt next year!! Hopefully a little more fit both in riding fitness and core fitness for the extensive HAB sessions.